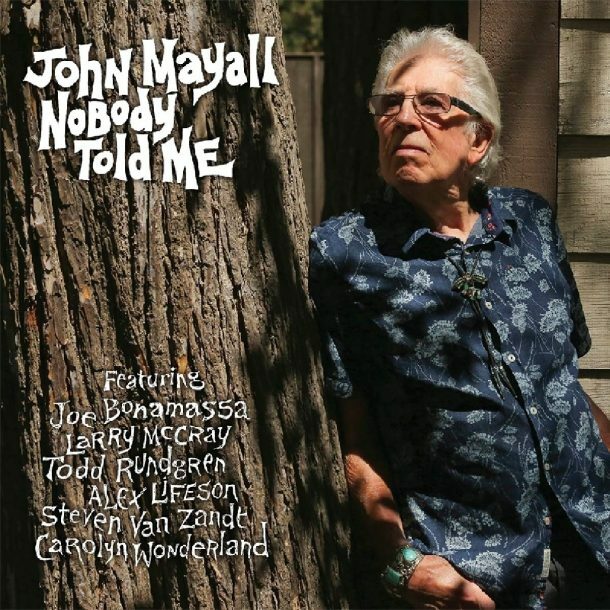 Unlike his last few solo albums, Mayall brings a handful of notable guests into the mix for Nobody Told Me, all of whom are nearly as busy in the studio and on the road as Mayall himself—especially Joe Bonamassa, who joins Mayall on album opener “What Have I Done Wrong” and “Delta Hurricane.” Also on the record are guitarist Larry McCray, guitarist Alex Lifeson of Rush, multi-instrumentalist Todd Rundgren, Steven Van Zandt of The E Street Band and guitarist Carolyn Wonderland. Mayall’s band (bass guitarist Greg Rzab, drummer Jay Davenport and rhythm guitarist Billy Watts) supports each guest in collaboration with members of Conan O’Brien’s house band, who fill in on horns. Though most of Mayall’s guests recorded their contributions independently, Bonamassa joined Mayall at the Foo Fighters’ Studio 606 in Los Angeles to play on his two tracks live. The songs are valuable contributions to the record—given their respective histories on the road and in the studio, both Mayall and Bonamassa are pros when it comes to laying down tracks efficiently and enthusiastically—but the remaining eight tracks don’t appear to have lost any quality from being recorded separately. For every song on the record, the musicians step in to perform at their best, a nod to both their flexibility as artists and their respect for Mayall’s legacy as a bluesman. Nobody Told Me has earned a positive response from fans and listeners since its release in late February. It spent four weeks on Billboard’s Top Blues Albums chart, peaking at No. 2 in early March and dropping within the top 20 in the weeks that followed. Mayall will be touring in the United States in support of the album starting next month, with dates across the continental U.S. scheduled through late August. As far as we know, Mayall isn’t fast-tracking his next release—but knowing his tendencies, it won’t be long before another strong album is ready to go.